If like me, you thought that the best part of the 2000 film Crouching Tiger, Hidden Dragon was Tan Dun’s soundtrack, then this concert was definitely for you. Chai Found Music Workshop is a traditional Taiwanese and Chinese music ensemble from Taipei founded twenty years ago by Chen-Ming Huang, Hui-Kuan Lin, and Chung-Hsien Wu. 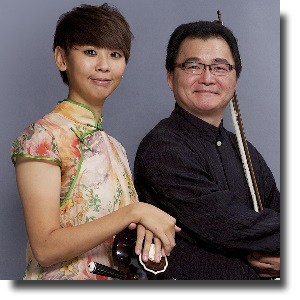 From the outset, their goals were to preserve the tradition of Taiwanese music and perform contemporary classical music as well as traditional Taiwanese music. Silk and Bamboo: A Musical Journey to Taiwan is indeed a cultural and artistic sojourn featuring Sizhu music which is actually a form of Chinese chamber music once played in the teahouses of Southern China. The programme is split fairly evenly across two distinct sets: the first consisting of Taiwanese folk songs, and the second, following a short intermission, consisting of contemporary music written as recently as in the last couple of decades. Chai Found perform on traditional acoustic instruments that are truly characteristic of the Taiwanese tradition: Erhu (two-stringed violin, played with a bow), Di (bamboo flutes), Guzheng (Chinese harp, played horizontally and supported stands), Pipa (similar to a European lute), Yangqin (similar to a hammered dulcimer with strings stretched over a sound board), Ruan (looks like an oversized banjo but more with a more mellow tone). Taiwanese music and Chinese music generally relies less on harmony and melody than on a kind of rhythmic interplay between stringed and wind instruments (no percussion). The group performs without a director, though Chen-Ming Huang tends to serve in the capacity of de facto concertmaster. Similarly to Western chamber ensembles, Chai Found present an integrated sound with few, if any solo expressions. The single exception to this evening’s performance was a pipa solo by Hui-Kuan Lin of the jazz inflected Buddha’s Delights. With Chen-Ling Lin’s Light and Shade, that features the bass version of the ruan, I found the tone sombre, if not depressing. However, the music doesn’t become burdened by its melancholic tone. The ensemble concluded the evening’s music selection with Hsien-Wei Tsai’s syncopated Expecting an Autumn Reunion and Ding-Lian Wu’s rhythmically complex Mind World.